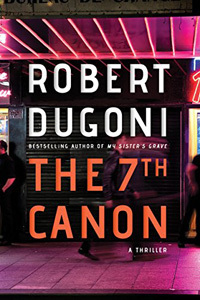 The 7th Canon by Robert Dugoni: Synopsis and Online Purchase Options. Synopsis (from the publisher): In San Francisco's seamy Tenderloin district, a teenage street hustler has been murdered in a shelter for boys. And the dedicated priest who runs the struggling home stands accused. But despite damning evidence that he's a killer — and worse — Father Thomas Martin stands by his innocence. And attorney Peter Donley stands with him. For three years Donley has cut his legal teeth in his uncle's tiny, no-frills firm, where people come before profits. Just as Donley is poised to move on to a lucrative dream job, the shocking case lands in his lap, and he must put his future on hold while putting his courtroom skills to the test. But a ruthless DA seeking headlines and a brutal homicide cop bent on vengeance have their own agendas. Now, as he unearths the dirty secrets surrounding the case, Donley must risk his neck to save his client's life … and expose the face of true evil.